December 29 – Big blow over and NOAA says 3-4 for Saturday. Finally a family day at the marathon hump. Well they were wrong there was some 6+ waves but the World Cat got us there. 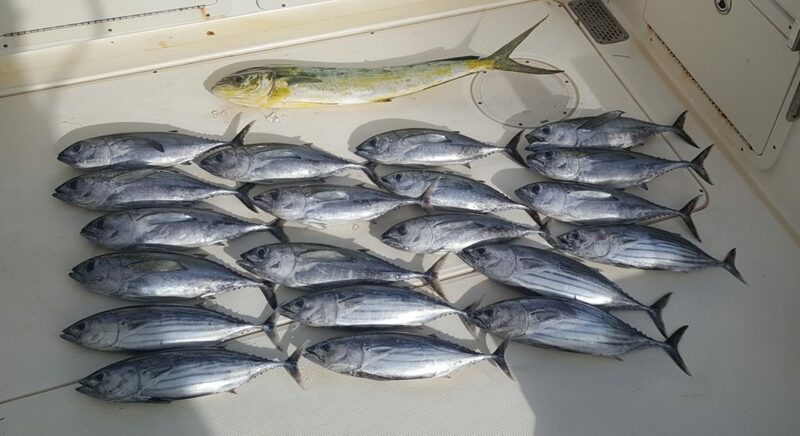 Made 4 or 5 passes and had all the tuna that I wanted to clean. On the way back stop a scattered weedline in about 650’ and put the spread out. Left long goes off and we have a dolphin on. 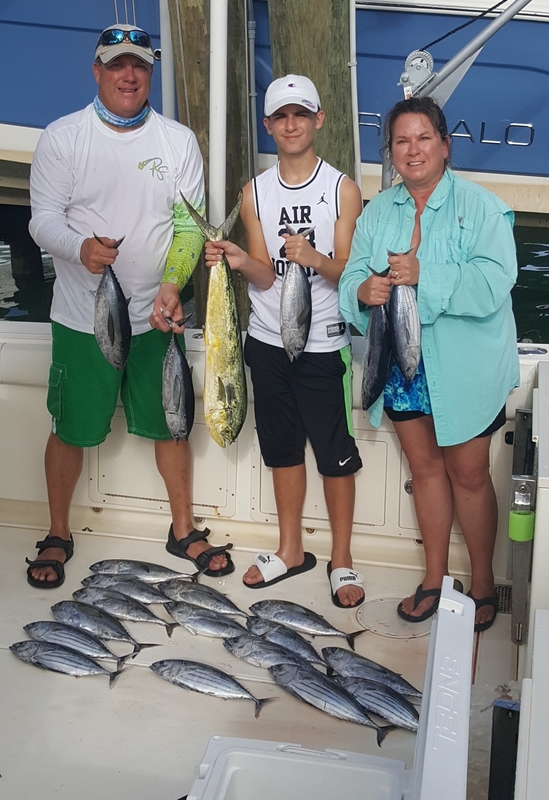 Nothing huge but a lot of action and Casey loves tuna. Two Days left to get some grouper. Set up on first spot no action. Went next spot looks a little more promising so I get set up. Already have some live bait so the bottom rod gets loaded first. Then set a live one off the transom with a balloon. Then I start working the chicken rig on the bottom to get more bait. 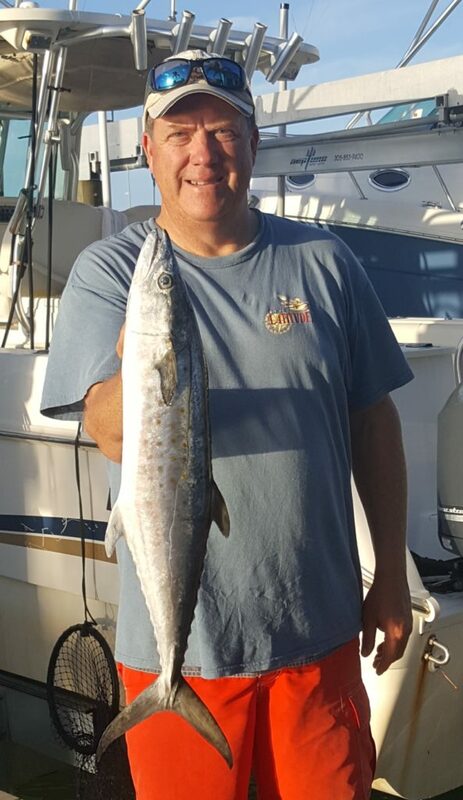 Picked up a nice rock hind, small yellow tails, grunts and a green eel. The next drop is pulling very hard but I finally get it off the bottom and up pops a nice red grouper. Caught two of these that got vented and sent back down. Next is the bottom rod that gets bent over and at first it puts up a good fight. He doesn’t last long and up comes a Yellow Jack. Then a couple drops later up comes an even bigger yellow jack. Reload and in a few minutes the bottom rod gets bent but not as hard as a grouper. 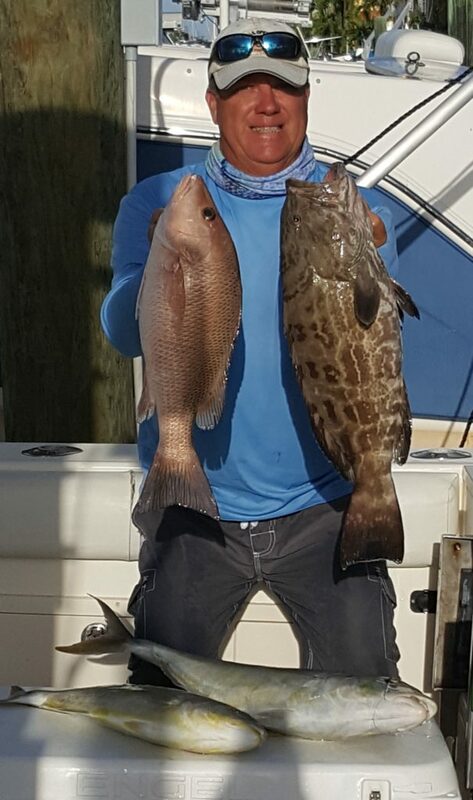 I am thinking another jack but up comes a 22” mangrove snapper. Box has some good eats in it but no grouper. 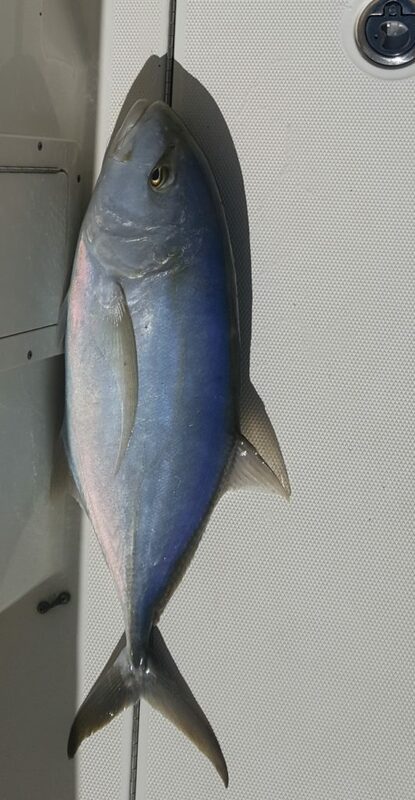 Keep working the chicken rig with the action slowing down and then I see a dolphin in my chum slick. Grab a rod with a bucktail on it toss it out and get hooked up. Mahi jumping and pulling hard on this 6500 spinning outfit. As I am working the dolphin I see my bottom rod double over in the rod holder. I put the dolphin on hold and start cranking the bottom rod and feels like a grouper. After getting the grouper off the bottom I go back to the dolphin. As she gets closer to boat makes a big jump, headshake and comes unhooked. 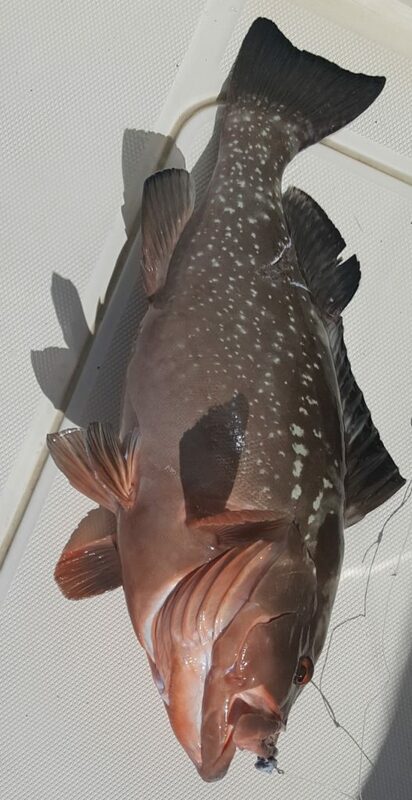 Now back to the bottom rod and work this fish to the surface and success a black grouper. With a box of good eats it is time to head in with one day left for grouper.